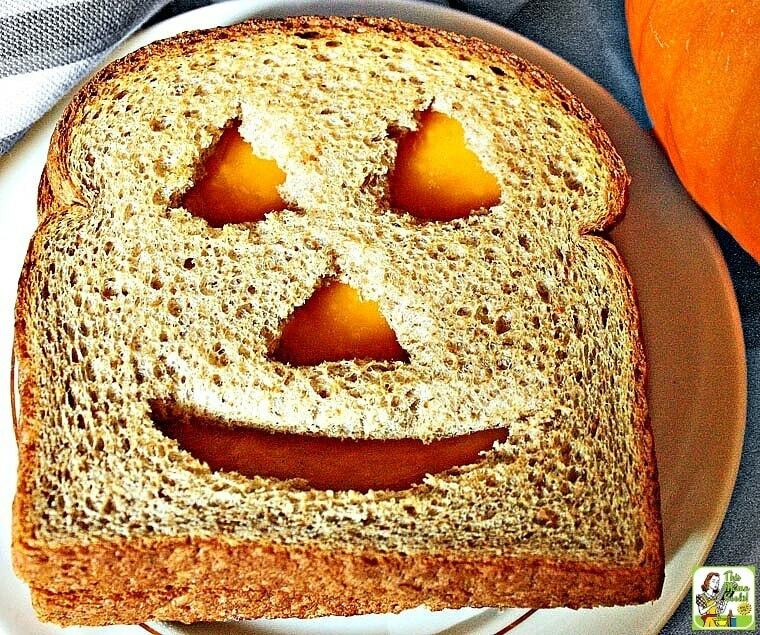 If you’re searching for Halloween sandwich ideas for a spooky kids’ Halloween party, try this Jack-O-Lantern Cheese Sandwich recipe! It’s the clever idea of my friend and contributor, Holly Clegg. Not only is this adorable Halloween sandwich recipe easy to make, but the Jack-O-Lantern Cheese Sandwich is a healthy alternative to all those ghoulishly sugary Halloween treats. I’m tempted to heat up a platter of these kid friendly sandwiches on a my 4-serving George Foreman Grill and have some striped Jack-O-Lantern Cheese Sandwiches. What do you think? If you’re gluten free, try this on your favorite gluten free bread! Grownups and adventurous eaters can add slices of ham, turkey, tomatoes, and lettuce if they wish to Holly Clegg’s Halloween cheese sandwich. To encourage your little ghosts and goblins to eat more healthy meals and snacks, you can find more of Holly Clegg’s trim& TERRIFIC® recipes at The Healthy Cooking Blog. Check out Holly’s trim & TERRIFIC™ cookbooks on Amazon, too! Spooky Halloween party dishes can be exciting and delicious without being full of sugar and fat. These festive Jack-O-Lantern Grilled Cheese Sandwiches are full of calcium and whole wheat fiber. Be sure to choose bread that begins with “whole wheat” as the first ingredient to ensure optimum nutrition. In the fall it becomes the ideal Halloween sandwich! Your kids will also love my Creepy Crawlers Sandwiches for Halloween. 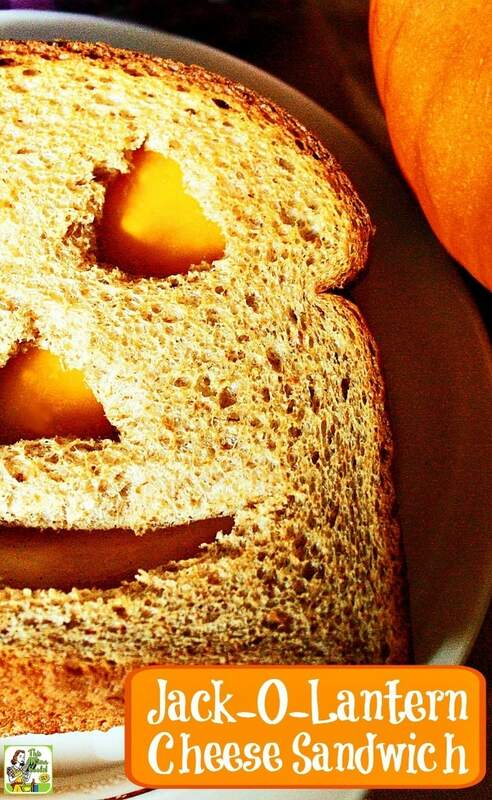 On one slice of bread, cut out a jack-o-lantern face. Place slice of cheese on an uncut slice of bread. Broil or toast in oven until cheese is melted. Remove from oven, and top with cut slice of bread. Picture and recipe used with permission of author. Originally published on October 12, 2015 and October 7, 2016. Updated with new pictures and information. 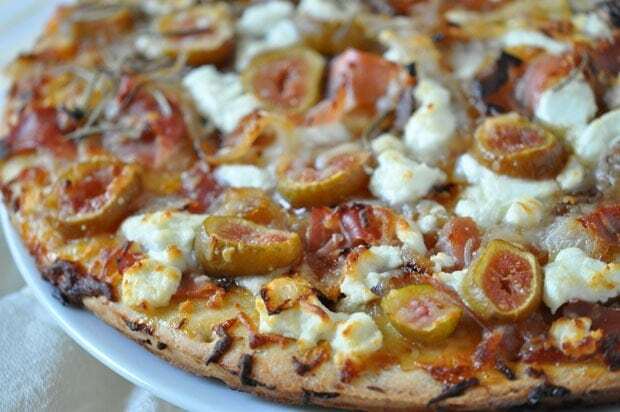 Posted in Gluten Free, Recipes and tagged cheese, Halloween, Holly Clegg, sandwiches on October 8, 2017 by Anne-Marie Nichols. Next post Searching for spooky Halloween cocktail ideas? Try a Dead Man’s Kiss Cocktail!